Star Wars Galaxy’s Edge Details! As we have seen lately, Disney has been much less “closed lipped” about the projects they are doing and their progress. Instead they have chosen to leak various images, schematics and hints to keep the public interest, beyond just a few random artistic rendering. SWGE will be fully immersive… FULLY. As we have seen with Pandora in Animal Kingdom, Imagineering can do amazing things with immersive theming and the right IP. 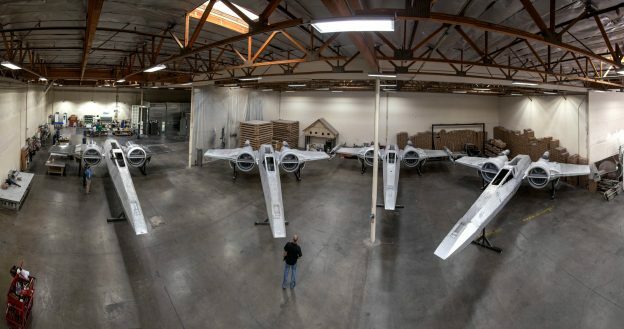 If the images they have released and the scale models over in Hollywood Studios are to be believed we will be fully immersed when walking around the planet of Batuu. All images property of Lucas Film, Disney, and Disney Parks. These are the droids you are looking for! Oh yes there will be droids. Free roaming interactive droids will be peppering the planet, base and cantina. Yes we did. There will be a cantina and restaurants in the new land much like there are in Pandora. Before you ask, yes there will be blue milk. There will also be a dinner-club location for a sit down meal immersed in Star Wars themed foods and drinks. Where can I buy a plush JarJar? 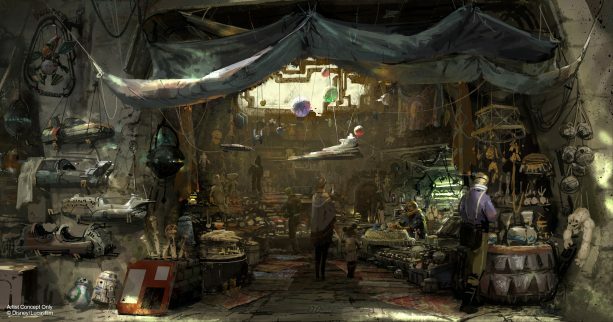 Hopefully nowhere…, but as this is in a Disney park there will be plenty of merchants and stalls to keep you spending on various Star Wars toys, clothes, merchandise and collectibles. Fine.. Fine.. what about rides? 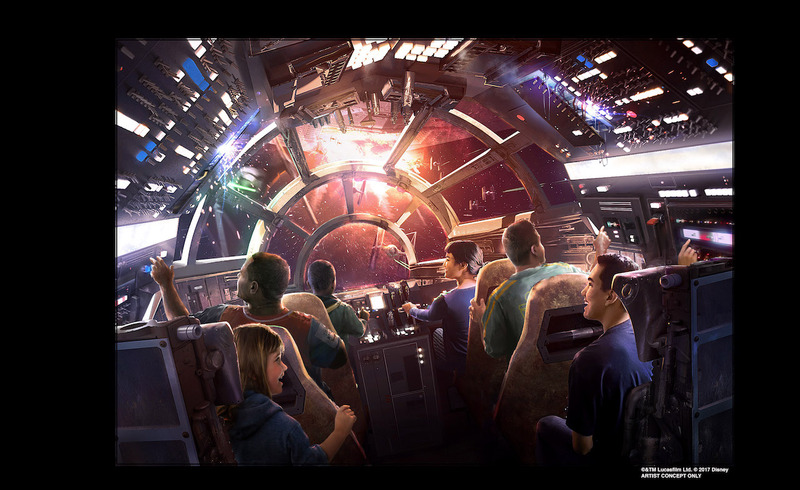 Well if the idea of flying the Millennium Falcon appeals to you then you are in luck. On the other hand if you dream of serving the Empire or First Order and want to walk aboard a Star Destroyer than you are in luck as well. A yet to be named attraction will put you aboard the massive transport on a scale never before attempted as guests board the hanger bay of a massive Star Destroyer. 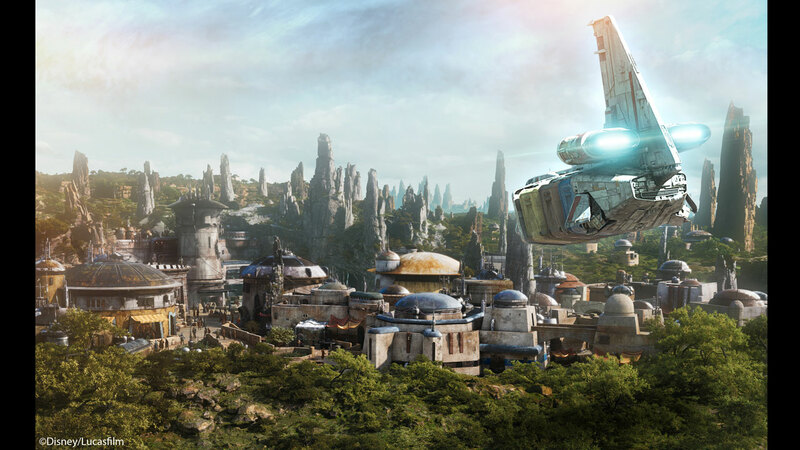 Batuu is the fictional planet so far un discovered by Disney guests and Star Wars fans. 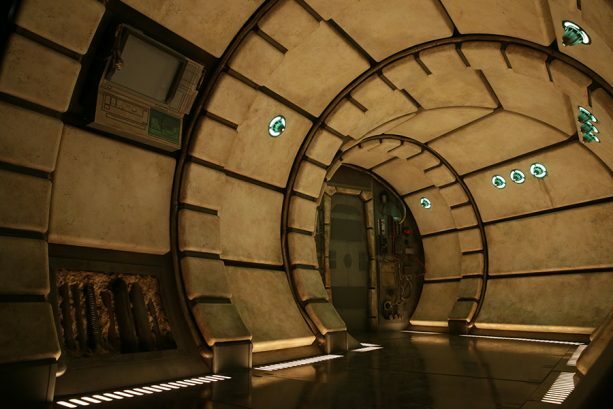 It is your usual “once a great hub of trade and commerce, now a den for smugglers and low-lifes”, kind of Star Wars location. Who will I meet on Batuu? Guests on Battu can expect to run across a variety of well-known and not so well known character including BB-8, Chewbacca, Kylo Ren, Rey Stormtroopers, First Order Soldiers and maybe even Rex (old-school Star Tours fans will recognise him). How big is this SWGE really? Honey I Shrunk the Kids Movie Set Adventure. There’s so much more to come but that is where we are so far. 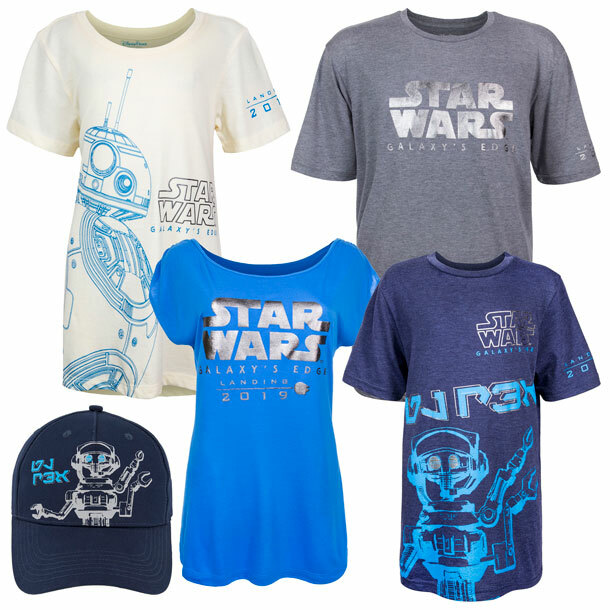 We still have over a year to go before the opening (tentatively scheduled for May of 2019) and as always as we get new updates we will keep all of our BtT and Star Wars fans in the know. Until then… May the Force be with you.. Feel the power of the Darkside!